After doing some research and reading several blogs, I've confirmed my diagnosis. I have Hemerocallis defiencii, otherwise known as Daylily Deficiency Disorder. Symptoms? I do not have enough daylilies in my garden and I have far too many 'Stella D'Oro' daylilies. This first one, a little blurry because I was in a hurry due to it starting to rain, is 'Pardon Me'. 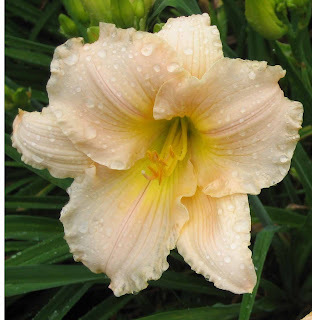 Then there is 'Siloam Double Classic', my only double daylily, and I just got it last year. 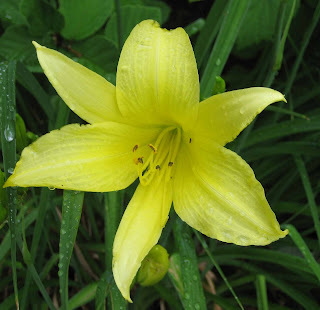 Here's 'Hyperion', a nice clear yellow, but a bit of a yawner compared to some daylilies. 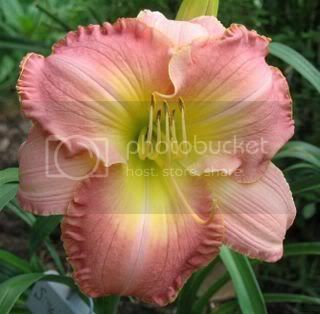 And 'Fairy Tale Pink', which has a few ruffles but not very many compared to other daylilies I've seen pictures of. Comparing my daylilies to those of garden bloggers like 'Gotta Garden' is like comparing a tin shack (me) to the Taj Mahal (Gotta Garden). If you check out this post of hers and look in the comments, she has offered some excellent advice on how to cure 'Daylily Deficiency Disorder'. It involves getting more daylilies, of all things. I hope it is not too late for me. I plan to start working on the cure this weekend! I think the deficiency is hereditary. I only have common day lillies and some yellowish ones. Well, you may have a deficiency but you're way ahead of me. Love those ruffled babies! When I went to Gotta Garden the other day, I thought I had accidentally been directed to a catalog site for daylilies. Now that's some serious lily-lovin'! Gotta Garden's Daylillies are FABULOUS! I never liked daylillies before, but then again I only have one type (a hand me down from you I presume) and I'm not even sure what the name of it is, but I've never liked the color. Now that I've been exposed to REAL daylillies, I must have some! So, take me with you when you go shopping - pretty please? One that Gotta Garden didn't mention in her post is that some of the newer daylilies look terrible after they bloom, like soggy used tissues. If you don't deadhead these types religiously, the spent blooms can seriously detract from the open ones. 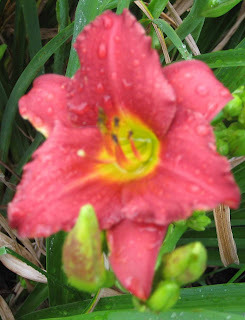 And if you have a lot of daylilies, it can become a project deadheading them daily. And I feel like I must put in a good word for 'Hyperion.' Yes, it is simple in form and pure in its color. 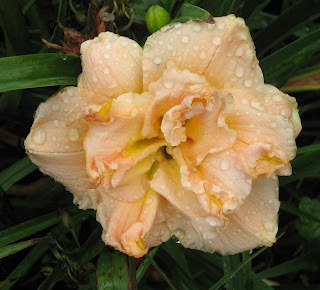 If every daylily was double and ruffled, the garden would look too busy. And 'Hyperion' has a wonderful fragrance. Plus it is very reliable. Make new friends, but keep the old. However, you have my permission to ditch Stella. I bought it mailorder because the color was described as canary yellow. Well, either I don't know canaries (a possibility) or they were doing the nurseryman's fudge. I thought it was going to be a pure yellow with no orange in it. Instead, it matches perfectly with 'Summer Sun' heliopsis, another plant I got by mistake. These two form the backbone of my purple and gold bed, because back then I could never bring myself to throw out a plant, and purple was the only color that made the gold tolerable to me. I think I may have that, But I do not have any day lilies whatsoever. Maybe this weekend I can get some. I know where I want to put them. I love that first photo and the fact that the name is 'Pardon Me'! It shouldn't have moved so when you snapped the photo! I have stellas, who doesn't? While the flower is the outrageous 'school bus yellow' the foliage is an outstanding texture in the garden. I'll put up with the flower for the foliage. Thanks for the comments! I do like 'Hyperion' by the way and would never get rid of all the daylilies I do have. I just want to add some more variety! 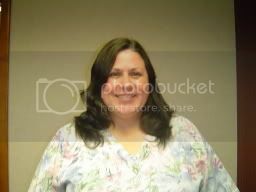 Hi Carol! Wow! Thank you so much for the very nice recommendation and link! I appreciate it! I will look forward to reading about your quest! There are few other flowers that give so much and demand so little, at least to me. You'll never guess where I was today...a daylily farm...lol...with my garden group...and this is big news...I didn't buy a thing! It was so unbelievable that when I told my DH this evening, he turned away from me and called out, "Release my wife, wherever you're hiding her!" Hehehe. A catalog, huh...well, I do like daylily catalogs! And, yes, I admit it...it's gotta be a sickness, but, hey, there are worse things! I love true lilies, too...in fact, an Orienpet, Silk Road, opened today...but it's about six feet tall...and those blooms will last a lot longer than a day! I grow them in with the daylilies. Thank you, Sister with the Homestead...I vote for you to go, too! Kathy has a point, although there are many plants that benefit from deadheading...my roses, for one, but you can't do everything! I can't even get to some of my daylilies to deadhead these days as there are three or four in front of them! It doesn't really bother me. I make the rounds twice a day and pluck off here and there as the mood strikes me. It forces me to really look at some. But, then I know I'm ...uh...unusual...lol! I also enjoy watering as I look and think and solve a lot of problems! I confess, too, that as I am hybridzing, those dangling blooms aren't going anywhere on some until I see if the pod has taken. I've read where people on tours go to great efforts to 'livehead' (taking off the day's blooms in the evening) to ensure a beautiful show. I'm much too casual for that! Cottage Magpie, how small do you mean? Grace Stamile, Elizabeth Salter and Jane Trimmer have done some wonderful small ones...but, I don't know if they're the size you mean. We can talk more over at GG, if you want. Thanks again, Carol...and please forgive my hogging the comments. I enjoy chatting about daylilies anytime! Gotta Garden... I love your comment and your enthusiasm for daylilies is contagious. I think I'm catching it! Hyperion is probably my favorite daylily because it is so fragrant.